Minecraft is a dream game for fantasy lovers. Not only is it a fully immersive, open-ended fantasy tale, but it's a platform for speculative fiction communities. Here's how to get into Minecraft and start worldbuilding. First of all, the story of Minecraft is actually kind of a classic horror story. You wake up alone on a beach, with nothing but yourself and your clothes. Your task is to find shelter and craft tools before the night comes. Because that's where the horror comes in: when the sun goes down, the monsters come out. If you don't dig up some dirt or chop down some trees and build a shelter, you will soon be overtaken by giant spiders, zombies, skeletal archers, and exploding green monsters called "creepers." These baddies also spawn in the dark underground. So as you start digging and hunting for the precious minerals in the earth, you come across dark caverns filled with these monsters. You have to make torches form the coal you find to keep away the dark, and you have to craft swords from the steel you unearth to defend yourself. And the world is procedurally generated, which means every step reveals newly created terrain with unpredictable features. You'll find lava lakes, giant cliff faces, rolling hills, and deserts, all waiting for you to explore and conquer them. In short, you are alone in a world that wants you dead, and you have no choice but to dig, build, and explore to keep alive. It's a giant, open-ended sandbox world that repopulates with deadly monsters every night. It's a classic horror story. But in addition to the horror elements, which, if you ask any Minecraft player, will leave you scared late into the night, there are a lot of other fantasy touches. For starters, the monsters, while randomly spawned throughout the darkened Minecraft world, can also be found in mysterious dungeons. The dungeons are made of a different kind of stone than the rest of the countryside. They don't look natural; they look built. At the center is a weird firey cage that spawns monsters, and around the room are discarded chests full of treasures. The dungeons hint at a secret fantastical history. It feels almost as if whoever left the treasures there also left these magical monster machines to guard their riches. But nothing is explicit in the Minecraft world, and you have to just face the horrors of the horde without explanation. Probably the most overtly fantasy element of the game is the alternative dimension, known as "the nether." If you construct a 2001-esque black obsidian gate and ceremonially light it on fire, it turns into a swirling purple gateway to a lava-filled, cavernous hell-dimension. This dimension is populated by giant, floating, fireball-shooting ghasts and zombie pigmen who scream like they're being tortured. It's a really terrifying experience, and it only adds to Minecraft's cred as a fully-immersive fantasy-horror world. Again, there's no explanation as to how these portals work or who discovered them. Coupled with the mysterious dungeons and (one of my favorite touches) the zombies in this world that are wearing the tattered remains of the same outfit as you, a picture starts to emerge of a fallen society of mages overtaken by the monstrous products of their own hubris, leaving only you to wander the abandoned countryside. A classic fantasy story. But the sci fi and fantasy appeal of Minecraft isn't limited to the game's story and world. The game also includes a pretty sophisticated creative component, where players can use the blocks harvested from the game (or spawned using inventory editors) to create art or elaborate structures. The result of this is that entire multi-player servers have sprung up in the interest of creating the coolest, craziest, and largest sci-fi tributes possible. For instance, the goal of this project is to create a one-to-one scale replica of the famous Enterprise-D. There are countless other spec-fiction inspired projects, including dozens of shire-replicas, countless Star Destroyers, worlds filled with classic video game pixel art, and even a pretty detailed replica of Half Life 2's City 17. New things happen each day, as larger groups make crazier plans, including more and more elaborate computing devices using the games rudimentary wiring and logic system made from red dust. The result is that Minecraft is kind of the perfect game for sci-fi and fantasy people. Not only does it offer a strange new world to explore and the classic scares of a speculative fiction horror story, but it also offers a platform for like-minded fans to geek out over their favorite sci-fi stuff. 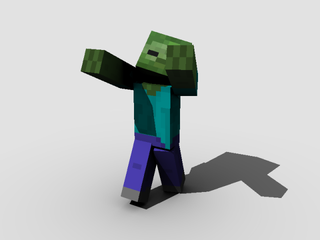 And in the world of geek alchemy, Minecraft is instant gold. Let&apos;s Send A Nuclear Reactor To The Moon!